On November 08th, “Wikipedia-based Education” teaching circle at Indiana University of Pennsylvania (IUP) organized a Zoom webinar on teaching with Wikipedia. Teaching circles at IUP are small groups of instructors and faculty who meet together to explore new pedagogical approaches and to address issues in teaching. The theme of this webinar was “Critical Approaches to Wikipedia-based Writing Pedagogy,” which explored ways to cultivate students’ critical literacy and critical thinking through teaching. Led by Dr. Matthew Vetter, five writing teachers attended the meeting, including Wenqi Cui, Lara Hauer, Jialei Jiang, Oksana Moroz, and Jiawei Xing. In this webtext, DRC fellow Jialei Jiang will provide a screencast video recording of the webinar (See below) and summarize the key conversations surrounding Wikipedia-based writing pedagogy. At the beginning of the webinar, Samantha Weald from Wiki Education Foundation, a nonprofit organization launched in 2010, was invited to deliver a talk on the role of Wiki Education in promoting the integration of the encyclopedia into classroom teaching and curriculum development. Following Samantha’s talk, both experienced and novice teachers shared their visions of developing and refining Wikipedia-based pedagogies. Themes that emerged from the discussion included both pedagogical opportunities and challenges in employing Wikipedia to inform critical literacy learning. During the webinar discussion, participants shared their thoughts on the pedagogical affordances and opportunities using Wikipedia. Dr. Vetter lauded Wikipedia-based writing as a fascinating pedagogical innovation. His first-year writing course design encouraged students to flip their existing notions of Wikipedia as an “unreliable” source of information and to think critically about what writing knowledge they can acquire in this online writing space. Specifically, students learned about the ways through which knowledge is produced, alongside the emergence of biases on Wikipedia. Dr. Vetter also described his effort in reminding faculty members about the exigency to rethink Wikipedia as a valuable pedagogical tool and resource. Another pedagogical opportunity afforded by Wikipedia is the integration of social equity editing as an incentive for students’ learning. For his undergraduate-level gender studies courses and graduate-level digital rhetoric courses, Dr. Vetter worked with his students to improve the representation of women and minorities on Wikipedia. Echoing Dr. Vetter, Jiawei shared his pedagogical approach of asking students to draft writing proposals, including the major information gaps on Wikipedia, the sources students collected, and students’ plans for using the sources in their edits. This approach allowed students to critically reflect on information gaps and source reliability before moving on to edit Wikipedia articles. One of the challenges of Wikipedia-based writing was the issue of students being overwhelmed by Wikipedia-based writing projects when they were first introduced to the projects. Dr. Vetter noted that it could be difficult for students and novice Wikipedia editors to broaden their understanding of Wikipedia as a knowledge-making space, and to confront knowledge as collaboratively produced and constantly evolving. Planning on using Wikipedia for her writing classes next semester, Lara raised a question about how to make the most of the encyclopedia in teaching critical thinking. Similarly, Wenqi had concerns over how to select topics for students to edit and how to assess student writing. To overcome these challenges, Samantha suggested that teachers use the Wikipedia online dashboard for guiding students through a step-by-step scaffolding process of evaluating sources, citing information, and drafting edits. Student training modules on the online dashboard are also useful tools to train student editors. For example, the “finding articles” module details ways to find good start-class articles for students to edit. In this way, both teachers and students will get the hang of how to make contributions on Wikipedia. Wikipedia-based assignments provide numerous opportunities for engaging in and studying digital rhetoric. Students editing Wikipedia have the opportunity to experience distributed authorship, peer-production, and digital writing first-hand, while also working to improve Wikipedia’s content, especially its coverage of marginalized topics. Instructors interested in engaging digital rhetoric might ask students to reflect on how the encyclopedia’s knowledge-making processes and policies influence its (lack of) coverage of certain topics or types of knowledge. For instance, how might Wikipedia’s overwhelmingly male demographic contribute to its inadequate coverage of women, with only 13%-16% non-male editors? Along a similar vein, the gender gap on Wikipedia can be further addressed using a disciplinary approach. As a proponent for a “disciplinary praxis” in a forthcoming publication this year, Dr. Vetter discussed how he, together with graduate students at IUP, had productively added to the representation of women and minority scholars in Wikipedia articles that were related to digital rhetoric and writing studies. In other words, he recommended that writing teachers and scholars work in collaboration with graduate students to expand Wikipedia’s scope of representing non-male scholars in our field of study. How can we use Wikipedia to increase students’ awareness of digital information literacy and information politics? How can we develop better pedagogical approaches for cultivating students’ critical thinking and critical literacy? How can we design Wikipedia-based writing pedagogies that help to build students’ rhetorical knowledge (such as the ways through which Wikipedia-based writing confirms or challenges “rhetorical canons”)? Using these pedagogies, how do we enhance students’ ability to write for public audiences? 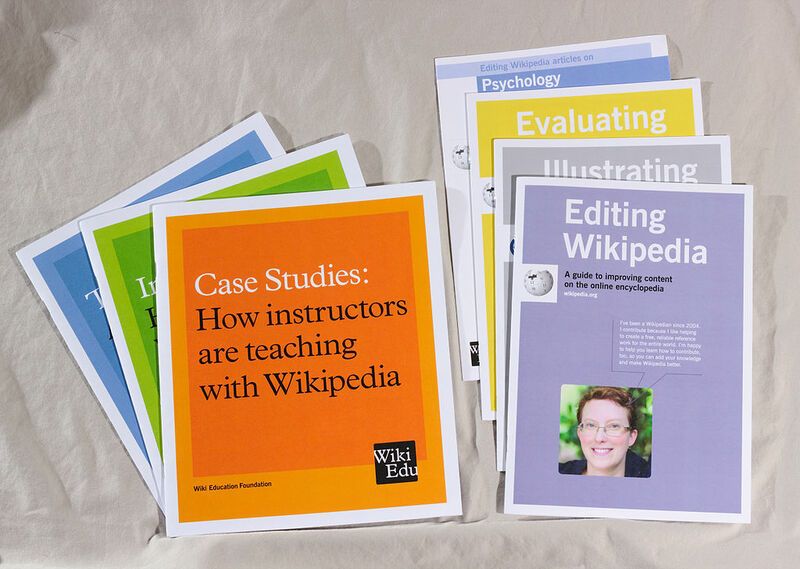 The following resources are for instructors who would like to assign their students to write for Wikipedia as part of a classroom assignment. Resources for Instructors: the teach.wikiedu.org landing page should be the first stop for anyone interested in the classroom assignment. Feel free to share this link with any friends or colleagues working at universities in the United States or Canada. You can also take a look at Wiki Education’s “Case Studies” handbook and any relevant subject-specific resources, the PDFs of which are available online here. The Online Dashboard: the Dashboard is a tool Wiki Education built to help track the work of students and scholars on Wikipedia. It also provides them with access to staff support and resources, and helps those with the need report back about impact. To take a look, visit dashboard.wikiedu.org. Feel free to create a Wikipedia username and log in there – you’ll get access to the instructor orientation and can create a draft course page using the assignment design wizard. Next Steps: As you browse these online resources, let Wiki Education staff know what questions you have. Wiki Education staff are here to help and can answer questions via phone, Skype, or email at any time. To read more about the Zoom webinar, please visit the Wikiedu blog.